Height 5 feet 5 inches. Weight 133 lbs. Chest 34-37½ inches. Complexion fair. Eyes grey. Hair fair. Sight in both eyes 6/8. Hearing good. Colour vision correct. Limbs and chest well formed. Full and perfect movement in all joints. Heart and lungs normal. Teeth good. Free from hernia, varicocele, varicose veins, haemorrhoids, inveterate or contagious skin disease. Vaccinated. Good bodily and mental health. No slight defects. Of note, small pigmented moles over the middle of left shoulder. Died of gun shot wounds to his right leg, compound fracture. On 7 June 1917 he was first reported missing in the Field; then he was found wounded in action, and admitted to No. 77 Field Ambulance before being admitted to No. 2 Casualty Clearing Station where he died. James Taku Strachan, known familiarly as Jimmie, was born on 22 March 1897 at Timaru, the older son of George Strachan and Iris Minnie née Cassells. He was the grandson of James Strachan who ran away from the ship “Strathallan” at Port Chalmers and, some many years later after travelling much of the country seeking work, came to Pleasant Point where he was very active in the Pleasant Point Presbyterian Church, as well as starting the bathing machines at Caroline Bay. His maternal grandmother was of Irish descent. Young James was baptised Roman Catholic, as Jacobus Strachan, on 9 April 1897 at Timaru. Jimmie started at Normal School Christchurch, when the family lived briefly in Christchurch; before continuing his education at Timaru Main School in 1902. It was at Timaru Main in the 1904 Infant Class A that young James was awarded a First-class certificate. After primary schooling he attended Timaru Boys' High School. In his teens he was a member of the Caroline Bay Swimming Club. In the 1912 25 yards dash he swam with a three seconds handicap, and in the 75 yards event he had the highest handicap - eleven seconds. The same year he competed in the T. R. C. Swimming Club’s wharf to wharf. Being the front marker he took good advantage of his starting 30 seconds until he was overtaken by some of the scratch swimmers. The next year he was participating in cycling – a road race over ten miles where he was allotted a handicap of 3½ minutes. In 1914 he was back in the water for the Rowing Clun 50 yards dash swim. May 1915 signalled a new challenge for James Strachan. He was in a batch of South Canterbury men who flocked to the colours and were accepted in Timaru for service at the Front. On enlistment James said that he was born in 1895 and was 20 years old, whereas he was born in 1897 and was only 18 years. He was of relatively small build. This fresh-faced young man, a telegraphist, was already serving with the Post and Telegraph Corps. He had joined the Post and Telegraph department as a message boy on 19 October 1911, at the age of 14 and earning £31 per annum. In 1913 he became a junior exchange clerk and messenger at Geraldine, before returning to Timaru as a distributor and finally a cadet until he resigned on 25 May 1915 to serve his country. His address was Telegraph Office, Timaru, and his next-of-kin was his father, a draper in Timaru. On 9 October 1915, he left New Zealand for Suez, Egypt, with the 1st Battalion of the New Zealand Rifle Brigade, Earl of Liverpool's Own. He saw action in Egypt and in France from May 1916. James was appointed a Lance Corporal on 5th October 1916. He had come through heavy fighting unscathed and without even a day's illness, until he was fatally wounded on 7 June 1917. Lance Corporal J. T. Strachan, 23/1204, died of gunshot wounds to his right leg, which caused a compound fracture. 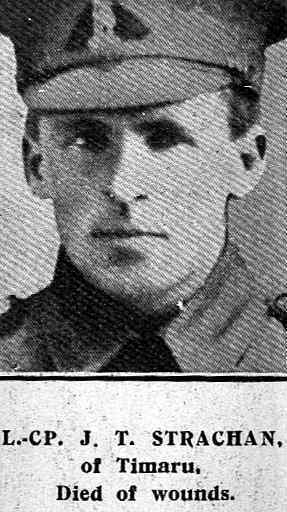 On 7 June 1917 he was first reported missing in the Field; then he was found wounded in action, and admitted to No. 77 Field Ambulance before being admitted to No. 2 Casualty Clearing Station where he died at 11.25am, just 20 years old, a victim of the Messines Offensive. He was buried in the Bailleul Communal Cemetery Extension, France. Although the Battle of Messines was a striking success, the New Zealanders paid a heavy price for success – a price paid in the life and future of James Taku Strachan. Of the lad we loved so well. He was remembered at the Timaru Main School, when the chairman at the annual meeting on 22 April 1918 proposed a vote of sympathy with the parents and relatives of ex-pupils who had fallen in the war. His Excellency the Governor-General, Viscount Jellicoe, opened the Timaru Boys' High School Memorial Library on 21 March 1924. Included in the names above the inscription "Their name liveth for evermore." on the roll of honour is J. Strachan. After the formal opening, the "Last Post" and "Reveille" and one minute's silence followed, and the hymn, "O God, Our Help in Ages Past", was sung. Three hundred boys went from the school and 52 did not return. From that date boys have looked with pride at the tablets housed in such a fine building. It was believed to be the only memorial of its kind in the country. In 2012 the South Canterbury Museum purchased a nearly century-old “sweetheart medal” given for friends of James' family. This military memento is of nine carat gold and is engraved with his service number and ranking.